It is time to say goodbye to the difficult inflatable movie screen or a heavy pull down PVC projector screen. -----------say goodbye to thin inferior material and wrinkles screen. ➤Only 2lbs, foldable laptop storage size 14" x 10"
➤Suitable for home theater, business meetings, exhibitions, conventions, outdoor picnics, presentations, etc.  GET YOURS NOW, ADD TO CART TODAY!  And you can immediately watch your favorite movies with your friends and family on an extra large 120 inch screen.  Have the best time with your kids and family while bringing Hollywood into your house! NO.1 High Quality Projector Screen ➤Provide Unprecedented HD Visual Experience for You " NO Wrinkles! Say GoodBye to thin inferior material"✌ Outstanding HAISHI outdoor movie screen made from natural polyester material, which is up to 2.5x thicker than others on the market! The milk smooth surface featured the best color absorbance and clearest/brightest HD projection result. HAISHI projection screen will take care of your eyes with less blue light reflection. Professional Portable Projector Screen ➤Perfect POCKET STORAGE SIZE 14" x 10"✌ Compact one-piece design, super lightweight and foldable. 2.2 lbs only, just fold the screen into your backpack or suitcase and you can take it wherever you want! Wide application at indoor and outdoor, suitable for home and office public use. 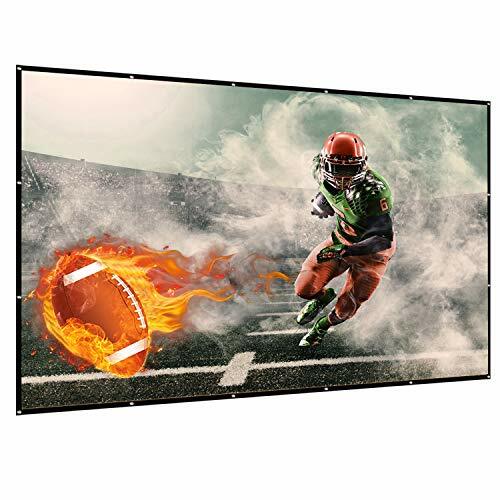 Essential Screen for Home Theater ➤You will be surprised that such a LITTLE PACKAGE could bring so much JOYFUL TIME✌ Get HAISHI video projector screen now and start a brand-new entertainment way. Just hang it on the wall, invite your families or your friends, cool down some beers, get some popcorn, enjoy the happy football/gaming night. Easy Fast 3 Minutes to Setup ➤ HAISHI movie screen will be your projector's best friend✌ Only takes 2 steps to finish setting: Firstly open the package; Secondly hung it on a wall using 16 metal hooks and 2 cuttable rope (included on package). If you forget something to bring on a camping trip, you can simply use brackets, nails or double sided tape to get the job done. What you get? ➤ HAISHI 16:9 projector screen package would be a great gift idea✌ Offering diagonal 120" format and 106" x 63" viewing area. We provide technical support for customers 24/7. Any questions about this portable foldable projection screen will be answered within 12 hours.